The company said it was slowly bringing affected systems back online but the "preliminary" cost of the incident had been about 300-350 million kroner. Overall production in this division was down 20-30% and one of its business units, which makes doors and windows, was "at a standstill". Kevin Beaumont said in a detailed blog about the cyber-attack that Hydro had shown off "the best incident representation response plan I've ever seen". 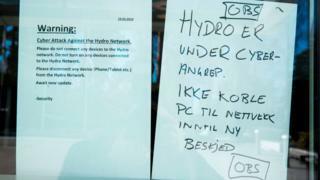 And Dale Paterson, who advises commercial companies on cyber-security issues, praised Hydro's latest update as "tremendous" for detailing the business impact of the attack.